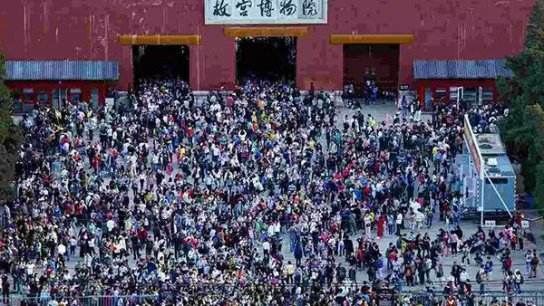 Some 461 million Chinese tourists traveled around the country in the first four days of the National Day holiday, the China National Tourism Administration (CNTA) said on Wednesday. The figure represents an increase of 11.4 percent year on year, the CNTA said. Domestic tourists spent 385.6 billion yuan (57.55 billion U.S. dollars) in that period, up 13.6 percent from the same period a year ago. The National Day holiday, which runs from Oct.1 to 8, sees a surge in passenger flows as leisure travel has become a major holiday entertainment due to improving living standard, a CNTA official said. Railway traffic was busy with at least 10 million trips made everyday in the past four days. On Oct. 1, 15.03 million trips were made, an all time high, according to the China Railway Corporation. Some 11.9 million trips were made on Oct. 3, up 9 percent year on year. According to Ctrip.com, a leading travel service provider, outbound trips are expected to exceed 6 million during the holiday. One of China's two "Golden Weeks", this year's National Day holiday has been extended by one day as the Mid-Autumn Festival falls on Oct.4. Travel demand appears to be stronger this year, possibly because the Mid-Autumn Festival is a time for family reunion.